Perhaps I am overstating things when I say that I feel fairly confident to write and reflect on life’s interruptions at the moment—especially when they are weather-related. Since moving to New York two years ago, I have experienced two hurricanes (one per year) and one blizzard. 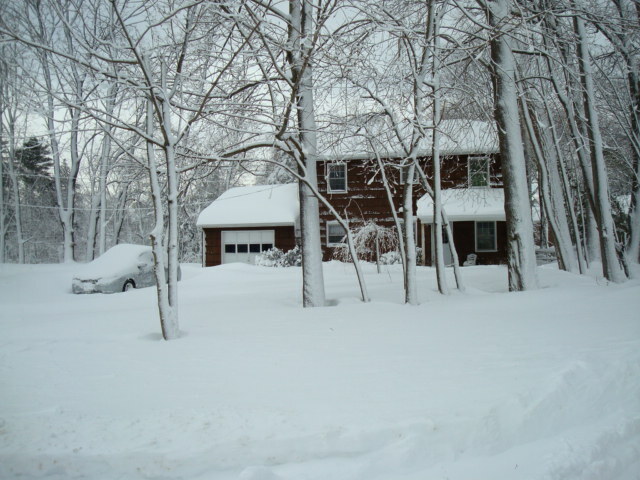 A week ago the snow fell fast and furious—the blizzard of 2013 unfolded. Inside my home, I scurried around preparing for an almost certain loss of electricity. The falling snow was heavy and wet, and forecasters predicted high winds during the night so it seemed inevitable that we would lose power. However! Living through two hurricanes has taught me a thing or two about preparation so I spent the day washing and drying six loads of laundry, running the dishwasher, running the vacuum cleaner, making soup and bread for dinner, and baking a pie. If we didn’t have power, at least we would have pie! Before you praise me for my domestic prowess, you should probably be chastising me for my compulsive behavior and for using more than my fair share of electricity. Remarkably the power stayed on, outside of the occasional power surge or flicker. The high winds never materialized, which was our saving grace. This was also the weekend of Stony Brook’s theater production, Much Ado about Nothing. Jacob played the part of Constable Dogberry. After weeks of preparing and several all-day Saturday practices, it felt almost cruel for Mother Nature to interrupt the performances. Friday night’s performance turned into a “dress rehearsal” for the boarders and faculty members who could walk to the auditorium, and Saturday’s performance was rescheduled for Monday night as almost three feet of snow fell! Thursday’s opening night performance was the only “normal” show of the three. Priorities shift in situations like these. Suddenly, shoveling snow and making sure you have enough food in the house becomes the focus. Simple tasks, like taking the dog outside, become more challenging when the dog can’t even keep her head above the snow. While I did enjoy the beauty of the snow, I confess that I didn’t curl up on my couch and read a book for the entire day while being snowed-in. My personality bent runs along these lines: since I can’t do x, I will do y (insert whatever you want for x and y). In this case, I roped Jacob into helping move some bookcases around the house. Sometimes I want to be really critical of myself in these situations. You should have spent the day reading or sitting by the fire and doing nothing. When do allow yourself to relax in your own home? These are good questions and ones I need to consider. On the flip side, every storm-related interruption doesn’t require me to stop all activity and not think about what can be done around the house. The writer of Ecclesiastes understands the notion of rhythms as they relate to everyday living. “The sun rises and the sun sets, and hurries back to where it rises. The wind blows to the south and turns back to the north; round and round it goes, ever returning to its course.” (1:4-6) Interruptions to our normal routines can be helpful because they force us to examine the God-given rhythms that allow space for both work and for rest. If every interruption turns into an opportunity to do more work and complete more tasks, than I am missing the mark. But sometimes I need to see the interruptions as a chance for downtime—an unexpected gift of free time where I choose to sit on the coach and read or stare into the fire for hours on end. It is hard to really stop and take time to rest. Are you, too, an oldest daughter? Yes, I am! I come from a family of task-oriented women too!